The silver lining of the weak commodity prices between 2011 and 2016 was that many companies within the natural resources sector were forced to become much more disciplined in their operations and expenditure. This shift ultimately left companies in far better shape to capitalise on opportunities, while ensuring more stability and resilience to better weather any downturns. A number of companies had capital project cancellations, operating cost reductions and worked to optimise future project returns. This lead to the unusual situation where the leading companies in global integrated energy and global mining are now trading with low financial leverage, good growth prospects, high dividend yields and share buybacks. Here we look at the key themes for this sector which is now providing a well-earned ‘purple patch’ for patient shareholders. Source: Bloomberg, Janus Henderson Investors. As at 15 November 2018. We view the current sell-off as a mid-cycle pause, with investors still unable to fully accept that the giants of world mining and energy can deliver sustainable cash flow and returns to investors. We believe they can deliver and that the sector leaders will be re-rated as other investments with higher valuations and less robust earnings disappoint in an environment of modest growth and interest rate rises. 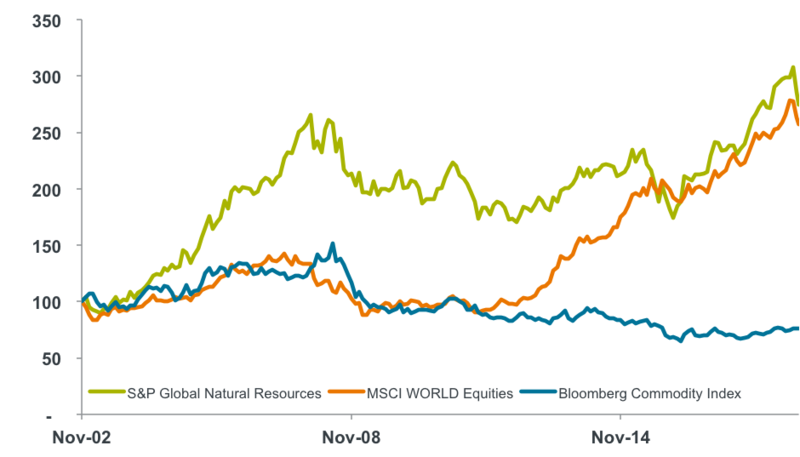 In our view, while a number of companies are undervalued due to volatility in commodity prices, a stronger US dollar, the threat of trade disruptions and the risk of a slowdown in China, we see the outlook for quality natural resources equity as positive. We invest globally in the three natural resource subsectors of mining, energy and agriculture. While Australia boasts two of the global heavyweights in BHP and Rio Tinto, the global investment opportunity is many times that of the domestic resources opportunity. In fact, the global investment universe is around 23 times larger than the Australian resources market and five times the market cap of the total Australian stock market, giving us a wide range of investment opportunities. Strong cash generation and capital discipline are providing a positive outlook for strong capital returns. The supply/demand outlook for many commodities appears favourable and shareholders are being rewarded with increasing dividends and buybacks. We value gold as a diversifier that should perform strongly in a weak market. The outlook for electric vehicle (EV) metals is strong. Beyond lithium, demand for metals like cobalt, aluminium and copper will also benefit from this thematic. Copper has seen years of under-investment, mine depletion and cost inflation, creating a very favourable long-term outlook. Battery demand for residential, utility and industrial applications will likely be more significant than EV-driven demand for battery raw materials. Selected companies are also benefitting from China’s anti-pollution initiatives, which has seen raw material imports focused on high grade materials in order to reduce additional processing, energy use and air pollution in China. Both BHP and Rio Tinto are among the winners in this regard. Similar to the mining sector, strong cash generation and capital discipline is a key theme. We have seen oil companies pivoting somewhat away from oil production growth and into domestic/pipeline gas, liquefied natural gas (LNG), chemicals and plastics, and mobility (reconfiguring petrol service stations). Oil may remain quite cyclical for many years to come, and we believe we’re possibly around two years into a five to six year positive cycle, where supply will lag due to the underinvestment in 2015-2018. Companies exposed to LNG are benefitting from the transition of some markets from coal-fired power generation as the focus on reducing pollution and greenhouse gas emissions increases. Consolidation, globalisation and technological innovation to increase crop yields have been the ongoing themes within the agriculture sector for the past few years. Amongst the major agricultural seed technology companies there have been two takeovers and a merger, with the six historic leaders reduced to four. Bayer acquired Monsanto, ChinaChem acquired Syngenta, and Dow Chemical and DuPont merged with plans well-advanced to spin-off a new company called Corteva in 2019. BASF, the other major agriculture player in the market has remained independent. In fertiliser and agricultural trading and services, Agrium acquired Potash Corp and is now very well positioned for a market recovery. Glencore has joined the traditional Archer Daniels Midland, Bunge, Cargill and Louis Dreyfus companies with a long-term view to further consolidate this industry. This sector has also benefitted from China’s insatiable demand for safe, high-quality food. This provides good opportunities for investors to partake in the gradual move of the Chinese economy from being driven by fixed asset investment to services. More insights and analysis from the team at Janus Henderson are available here.